We are absolutely delighted to have received the attached letter from the Rt Hon Nick Gibb MP - Minister of State for School Standards. 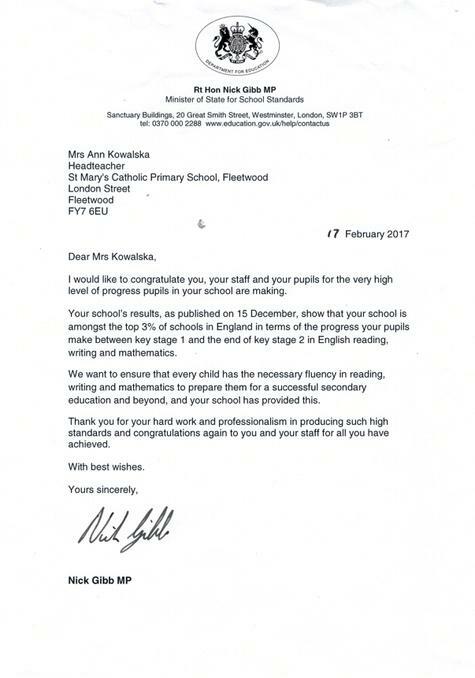 It is a congratulatory letter in recognition of our 2016 Key Stage 2 assessment results, with particular focus on the fantastic progress made between the end of Key Stage 1 and the end of Key Stage 2 in English Reading, Writing and Mathematics. We are extremely proud of all of our children and staff for all their hard work and dedication and also the commitment and support of our families. Well done to everyone - a great achievement for our school.